I would like to move the primary telephone socket from the downstairs kitchen to the upstairs office so that I can get the ADSL Router away from the kitchen appliances. I do not want to run an extension from the kitchen to the upstairs as this would impair my already poor ADSL connection (I know as I’ve already tried it). The question is, am I allowed to do this or do I have to get France Telcom to do it for me? I hope you can because I renewed mine, right back to the box on the outside of the house where the incoming FT cable arrives from the telephone poles. I know it doesn’t directly answer your question but a few years ago, when we wanted a second line installed, FT came to connect it to the same box and made no adverse comment. Maybe they didn’t even realize! There were/are no security seals on this box. In another century, and as a state agency, FT considered itself almost as the master of your chateau. European telco’s didn’t allow their clients to connect anything else than their own stuff. Rewiring by the DIY: one way ticket to a scaffold. In this century things are more relaxed. That’s why I dared to write a few words about theFrench telephone connection. Before starting the rewiring, perhaps have a look in your primary telephone socket, and remove a capacitor, capable of almost destroying a perfectly healthy adsl signal. Thanks for that Robert but I’ve already replaced the primary telephone socket with an “Omenex – 491882 – Filtre ADSL maître” but it made no difference. Now if I could get FT to renew the cable from the DP to the house that would help, but they’ve declined to do it. This is true even though an FT engineer, who came to inspect it, said it would help if each house in the three house hamlet had their cables renewed. Guess it’s a cost issue. Barrie, did FT do some measuring? They can do a lot of distant testing. Having the privilege of an analogue modem connection, and a lot of problems, creeping speeds of 14K4, frequent lost connections, I asked them (Orange) to check the line. There appeared to be a fault condition described as: ” PCA PONTI A -4V “. They explained that on wire A there should be a zero voltage, and in our case this was minus four. But exactly within the range of non-intervention, being minus 4 to plus 4 Volts. In other words: this value should have been more off target to trigger some action. A pity. Another test showed also that there was, and still is, something wrong: “FBA 970ko” indicating a “fuite batterie A“. They can also check the quality of your adsl connection, simply by measuring so called CRC errors using nice utilities available with a few mouseclicks by FT/Orange technicians. If too many CRC errors occur, they (sometimes) send in a service team, to check the qualtiy of the local telephone cabling. On another forum someone reported about these procedures, and FT diagnosed the problem, and finally replaced 250 meters of their cabling. En bout de ligne, five, six or sometimes seven kilometers away from the local telephone exchange you will always receive only the “leftovers” of the original signal power, exhausted by the wiring resistance. But even then you should continue knocking on FT’s door to get their attention, when suspecting that there is something wrong with their wiring. As far as I know, normally your need to apply to France Telecom. But this is usually too dear , too long for most. I suppose the easy solution is to make a network over your electricity lines, with this type of equipment ( just an example to picture the type of equipment ), not a recommendation. Thanks Robert will certainly ask FT to test the line again – good idea! The problem is we’re in excess of 6km from the Altactel DSLAM with attenuation @300Khz reported by the 2700HG-V router to be around 80dB; so FT have the ideal cop out. Definitely worth asking for a retest though. Thanks for the suggestion but I already use a Homeplug to bridge the Ethernet from Kitchen to Office but, as RobertArthur points out, it does nothing to improve the ADSL Sync Rate (typically around 800 / 320 Kbps). A signal level of only -80 dB? Not too much, this is where every extra dB of signal level will help. Rule of thumb: 13 dB loss per 1000 m, depending on wiring gauge. There are three wiring gauges (calibres 4/10, 6/10 and 8/10) used by France Télécom, you’ll see them in the details of adsl tests of DSLValley, the test d’éligibilité, and others on the French internet as Degrouptest. Input: your telephone number. Based on FT’s wiring database you’ll get an indication – theoretical values – of your niveau d’affaiblissement, your line attenuation. For very low signal levels in the range of -70 to -76 dB providers propose a so called ReADSL connection: less bandwidth, more signal level and of course lower speeds. The provider should have a DSLAM in the local telephone exchange capable of handling this protocol. Your modem and the DSLAM should perform some auto-negotiation to decide how to communicate with each other. Sometimes there are problems – low signal level – and something goes wrong. A misunderstanding. As a solution, to get a more stable connection, providers adjust something, changing your port in the DSLAM to another, lower speed setting. This will probably the first step your provider will take, especially when there are loss of sync/reconnect problems. A simple question: did you already compare the theoretical signal level with your modem reports? Because below -76 dB providers say no to an application for an adsl connection. And having one, one might suppose that there has been a bit of additional signal degradation the last few years in the outside FT cabling. 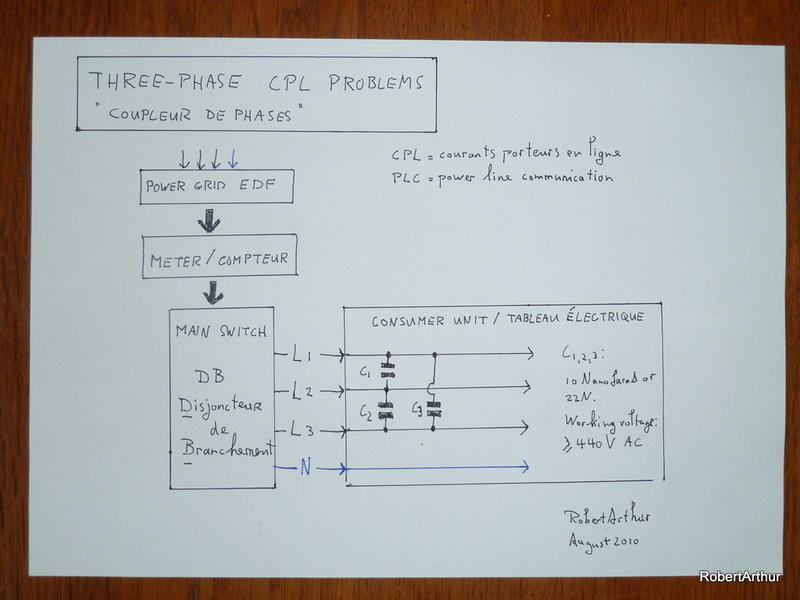 A simple remark: using a Homeplug network in a single-phase installation électrique is easy, but with three-phase it can be difficult. That is where coupleurs de phases come to the rescue. This is one of Legrand, please take note of the three capacitors inside this module, and this is a low cost version. Thanks for your VERY informed and useful assistance – it really very much appreciated! FT believe we have a much lower attenuation than we actually do. Don’t know why but it has always been the same. We started off our ADSL path with FT using ReADSL with a Netgear DG834G v4 (Broadcom chipset). But according to FT in Bordeaux we didn’t need ReADSL as G.DMT would do the job. However the local FT Engineers who visited our house said that the ONLY way for us to get Broadband was to have ReADSL. Hence we got going in 2005 with ReADSL. In late 2010 things had improved somewhat at our local exchange with both hardware and firmware upgrades so we decided to try and change to Découverte and ‘phoned the English speaking Client Services. No problem, they told me, but the accounted needed to be capped at 2Mbps. Great I thought €6 a month cheaper and the POSSIBLY of a fast connection – couldn’t wait. The very next day at 18.30 they changed me over to the new account. I know this for certain because at that precise moment the DG834G v4 lost sync and refused to regain it even after 2 hours. I swapped out the DG834G v 4 for the DG834G v 3 (AR7 chipset) and it synchronised immediately and at a slightly higher rate than before (608 / 320 kbps). Over the next couple of months I tried various Routers but all failed to Sync EXCEPT for the 2wire 2700HG-V which synchronised immediately and at a much higher rate (834 / 320 Kbps). I still use this 2wire which I purchased on Ebay UK for £6. In summary then, FT believe our line is a lot better than it actually is until they “come on site” – that’s why we’ve got DSLMax and not ReADSL. A word of WARNING : the 2wire 2700HG-V works well with the kit at our exchange (Alcatel v 1) the same is NOT TRUE at other Exchanges with other flavours of DSLAM – I know I’ve tried it!